God had the Samaritan’s Purse medical team in the right place to give Gideon the treatment he needed. 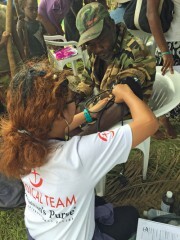 Doctors and nurses working with Samaritan’s Purse to help Cyclone Pam victims in Vanuatu were doing medical assessments in the northern area of Tanna on March 21. While at one of the villages, a 7-year-old boy named Gideon started to have a seizure. Our team quickly determined he needed to be taken to the only hospital on the island, about 40 minutes away. Gideon was put in the back of a Samaritan’s Purse truck, along with his father. 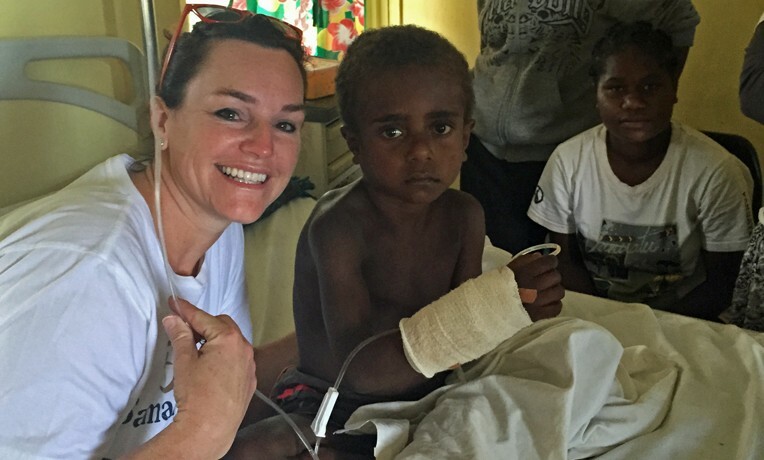 The Samaritan’s Purse team of two doctors and three nurses was the first to arrive in this village in Tanna with medical care. Our team praised God that He led us there in time to bring treatment. Along the way, Gideon became totally unresponsive and then his heart stopped. One of our nurses began CPR as the vehicle continued on. “We did CPR for at least 20 minutes and every one of us prayed for his life,” said Kelly Sites, a nurse serving with Samaritan’s Purse. Gideon’s heart finally began to beat again and he opened his eyes. When they arrived at the hospital our team stayed to help with his medical care until he was stable. On Friday, Gideon was sitting up in his bed and his fever was gone.